An Introduction to Edible Plants in the Southeast — Learn. Survive. Thrive. When living in an apocalyptic environment, food might become scarce, and you might find yourself asking, now what? Once you’ve gone through all the canned foods, and perishable items, you might have to start looking elsewhere, but where? The answer is probably closer than you think; the outdoors. You can find many things to eat, with high nutritional value, right in your backyard. This will be a 5 part series in which I will cover plants edible plants readily available in the different geographic areas of the United States. Today, I’m going to tell you about the Southeast, which includes the states of, Georgia, Florida, South Carolina, Alabama and Mississippi. I will go over what plants you can find that are edible, and ones that you should stay away from. You have to be extremely careful when choosing plants. Many plants look similar, and you wouldn’t want to grab the poisonous one by mistake. Wild Onion (Allium Canadense): This plant is related to wild garlic, and is often mistaken for it, as well. Wild onion has a strong onion smell, and of course, taste. CAUTION: If it doesn’t have a strong onion odor, than it isn’t edible, and is most likely it’s very toxic counterpart. HEALTH BENEFITS: Wild onion provides great immune system support and helps keep healthy cholesterol levels. CONSUMPTION: To get them prepared to eat, just give them a few minutes in boiling water, and they’re good to go. WHERE TO FIND THEM: You can find wild onion in meadows, fields, and moist or shady woods. POISONOUS COUNTERPART: Daffodil (Narcissus): While wild onion is beneficial, the daffodil isn’t. People can easily mistake them for the wild onion because each has a bulb, but there are many differences between the daffodil and the wild onion. DIFFERENCES: Leaves on the wild onion are round and hollow, while the daffodils are flat and thick. When you pluck the wild onion out of the ground, it has a strong onion odor. Also, as you’re cutting the leaves, you will notice the strong smell, as well. The biggest difference is that the wild onion WILL NOT have a flower attached. SYMPTOMS OF POISIONING: Nausea, vomiting, diarrhea, and abdominal pain. The bulb can cause severe irritation to the mouth. Usually, if you don’t ingest anymore, the symptoms will subside after a few hours. The bulb is the most potent, but eating any of this plant will make you sick. In animals, the poisoning can be much worse, so please be careful and watch your animals. Persimmon (Diospyros Virginiana): This plant is also known as the date plum. It’s very sweet when ripe, but otherwise very sour. If you notice that it’s green, it’s not ripe and you should let it go just a little while longer. The persimmon is yellow-orange to an orange-red fruit. They’re usually a little small, around half inch to four inches in diameter. HEALTH BENEFITS: The persimmon supports eye health, improvement in digestion, increases your metabolism, strengthens your bones, lowers blood pressure, and much more. CONSUMPTION: You can eat it dry, cooked, or raw. You can also make many things with it, such as jams and sauces. WHERE TO FIND THEM: Persimmon can be found in clearings and meadows, fields, dry woods, and pine lands. Arrowhead (Sagitraria Latifolia): This plant has leaves shaped like arrowheads, and attached is the tuber of the plant, which resembles a potato. HEALTH BENEFITS: Arrowhead can prevent diabetes, Alzheimer’s disease, supports lung and respiratory health, fatigue, helps treat anemia (which could be a huge benefit if you don’t have access to red meat), lowers the risk of heart problems, and keeps the pigmentation of your hair and eyes healthy. CONSUMPTION: Since it’s just like a potato, you can treat it as so. You can peel it, dice it, and roast it. If you’re unable to peel it, I believe it would be safe to eat with the skin on. Since none of this plant is toxic, I think you would be okay. WHERE TO FIND THEM: You will find arrowhead in canals and shallow water. To find it, the best way is to wade in the water and then once located, just pull up on the plant. POISONOUS COUNTERPART: There is another arrowhead plant that is mildly poisonous. You find it normally in gardens, or even in homes. The leaves are heartshaped when it’s a younger plant, and arrowhead leaves when it’s older. SYMPTOMS: Irritated skin, upset stomach, vomiting. If you have this plant inside, please make sure to keep all fallen leaves off the ground. Wild Strawberry (Fragaroa Viriniana): The flowers from the wild strawberry plant are around ¾ inch wide, with five white petals. The petals are attached to a cone-shaped part of the flower. The cone starts off yellow, then gets larger, thicker, and then eventually redder. That is what turns into the strawberry. CONSUMPTION: You can eat them raw, so enjoy! WHERE TO FIND THEM: Wild strawberries grow around woodland borders, meadows, fields, slopes, and near roadsides and fences. POISONOUS COUNTERPART: The mock strawberry isn’t documented to be poisonous but the taste is very bland and dry. It’s not something you would want to eat. It’s actually considered a weed. DIFFERENCES: The biggest difference is that the flower is yellow, instead of white. HEALTH BENEFITS: Even though I wouldn’t suggest eating the mock strawberry, you could definitely use it for medicinal purposes. The mock strawberry can be crushed and used externally on a number of things such as, boils, laryngitis, weeping eczema, traumatic injuries, snake and insect bites, and abscesses. 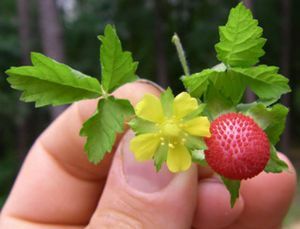 The mock strawberry can also be used to bring down the swelling, and a mix of the flowers can promote blood circulation. On top of all of this, the mock strawberry can be used to heal many other skin diseases, as well. So if you do find this strawberry, don’t pass over it. You may not be able to eat it, but can definitely use it for other things that are just as beneficial.